There's a second triangle on eBay with a reported faded line between the doors, but I doubt thats the sport. If its not, what is the sport's difference? Best haul I've had for ages..
plus I also has 2 x 2p Ankh stamps in one LBE and 2 x 3p postage due in another, but have been unable to find a sport on either so far. The line isn't the sport, and neither is Frank's (the eBay one). I'll add a spoiler to the relevant thread about what the sport actually is. What is the 3p postage due sport? 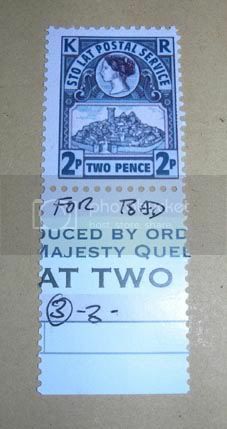 OK, in 1 Spring Posy and 5 Naming of the Streets LBEs (a huge number for me), I got a mis-perforated 3p Assassins, a 5p Sto Lat broken tower, a free LBE token and a Plot Number 3 token (I wonder if I can change the 3 to an 8 ). I was also able to gather together enough duplicates (including stamps from my spares) to apply for 12 GCTS plus I got 6 new stamps for my collection, 2 new LBEs, trading cards and the Peoples Republic of Wincanton Farm Collective stamp on the envelope. I would have liked a new triangle or a Tower of Art Falling Man (I only got falling birds) but I can't complain. Altogether, a very good haul. The line between the door is different on all 4 triangles that I have seen. It is so thin that the printing is not of high enough quality to make it consistant. I went back through my LBEs and in them I got... a defaced stamp? Can anyone shed any light on it or anyone got any others written on? I'm intrigued to know what the rest of the sentence is. bezam wrote: I went back through my LBEs and in them I got... a defaced stamp? Can anyone shed any light on it or anyone got any others written on? I'm intrigued to know what the rest of the sentence is. If it's someone at number 41 doing the writing, and if it's got anything to do with Bernard, the next word must surely be "behaviour". They foolishly left Bernard with the stamps and told him to put them in envelopes. They forgot to remove all pens. I have a top left corner similarly defaced.